From an odd story about cheating at cards in the presence of a Duchess, in an issue of Good Housekeeping of 1911. Her gown was rather less imposing than anyone else's. I don't mean that it wasn't a credit to her hostess, but it seemed to do less striving for effect than our own. It was of a soft, clinging satin, in tones of palest gray. Except that the top was creamy with lace, it seemed not to have been "composed" at all. But for a dog collar of magnificent yellow topazes set in silver, she wore no gems. It was whispered about that the Duchess was patriotic in her wardrobe, and that this gown came from Liberty's in London; whereupon my smart neighbor concluded, "Well, if that is Liberty, give me Death." But I liked it— the gown, I mean. It was willing to be forgotten. It was perhaps the strongest impression that she made upon me, that one forgot her gown and her title in the charm of the lady herself. At first I thought the caption said, He wanted drains. My husband wanted brains too. However, he had to make do with my beauty as well. Love the picture! It really got my mind going. First it made me think of Gentlemen Prefer Blondes (which I watched yesterday) just at the end where Ms. Monroes character is arguing with the rich father about motives in marriage.I also seem to remember that one archaic use of want means lacking.But I also thought: evil scientist who wants brains! Hes got that perplexed look on his face while staring at her head because hes wondering how much time he has after he kills her for her brain to still be viable for his experiment. It takes a steady hand to open a skull without damaging the grey-matter, and that takes time, confound it!I apologize for my disturbing chuckle just now. Ive been going around all morning saying Braaaaaiiiins in a zombie voice.Also: love how the candlestick phone looks like a creepy disembodied eye. Clearly, He is a mad scientist. Of course! Liberty of London was the de facto flagship store of the Reform or Aesthetic dress movement — the fashionable side of the Art Nouveau, Pre-Raphaelite movement in the other decorative arts. The early Liberty gowns are gorgeous partly because theyre so much softer and less structured than other dresses of the period, but they did get made fun of (in the greenery-yallery, Grosvenor Gallery, Gilbert and Sullivan sense.) There are some great Punch cartoons as well! Is he interviewing for a secretary, perhaps? Whats up with her left hand? Is she reaching for something in her purse? Is she going to pop him off? I read wanting as lacking. 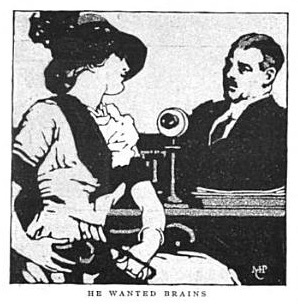 If I as a modern woman have been frustrated by a man in a powerful position with little brains or imagination, then a woman 100 years ago must have known the same kind of man. The mad scientist interpretation is not without its charm.As if I didnt love Liberty enough, now I do even more for being the fashionable side of Art Nouveau. Anonymous 7:05 i agree I think she has a revolver in there! how unpatriotic of me to find the If that is Liberty, give me Death comment clever. :)braaiiiiiiins. Oh my goodness I got lost in that GH! Wonderful stuff. Magazines are not what they used to be….. and I so love your blog. It inspires me to keep mine up. I am only two years behind in posting anything.